This was supposed to be a longish desert trip designed around a legal-access trip to the Tiefort Mountains highpoint, a P2K buried in the heart of the Fort Irwin Military Reservation in the Mojave Desert. There are forms to fill out, backgrounds to check, a minimum numbers of participants required and a safety video to watch, all in the name of satisfying Army protocol. Our hike was cancelled in the week leading up to the trip due to manuevers taking place on the base all month long. Why we didn't know about this ahead of time is beyond my understanding but I didn't want to cancel the trip outright. I ended up on a solo desert trip for six days, chasing down P1Ks (and P900s, too) in and around Joshua Tree NP. Because I was starting from San Jose at sunrise, I wouldn't have a full day of hiking for this first day with some eight hours of driving to do. I made a stop enroute to tag a P900 off SR247. This unnamed peak is the second most prominent summit in the Granite Mountains located near Stoddard Valley, between Apple Valley and SR247. The dirt Johnson Rd provides an approach around the north side of the range, allowing one to get almost within a mile of the summit. This road deteriorates about 1.5mi west of SR247 and with a low-clearance van I would have to be content with a 3.5mi approach instead. 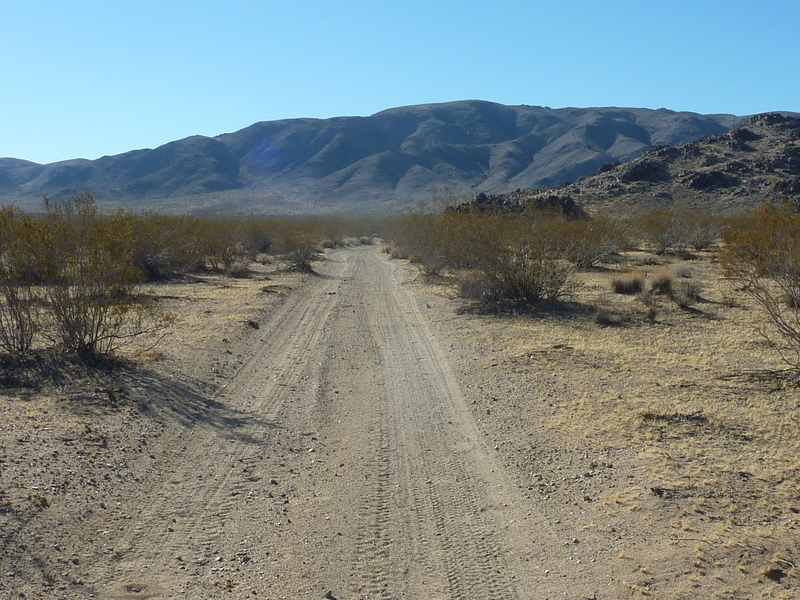 Around 2p I parked just beyond the last desert home a few hundred yards to the east, then struck off across the desert flat to approach via a wash south of Johnson Rd and east of the summit. I found another BLM road here that took me to the mouth of a modest canyon before petering out amidst the bouldery rubble of the wash. I climbed some 1,000ft over the next mile as I stuck to the dry streambed, possessing neither tedious nor exciting scrambling over its length. I eventually climbed onto the broad plateau that comprises the summit area, spread over many acres. The map shows two small closed-contours vying for the highpoint, one to the northwest, the other to the southeast. I visited both, finding neither to be obviously higher, no survey tower remains, no MacLeod register, nothing to help identify the actual highpoint. The summit was too broad to provide for good views, and some afternoon haze over the desert surroundings didn't help any. I descended via an eastern ridgeline I had spied during the ascent, a route which turned out to be easier and more pleasant with late afternoon shadows creeping over the landscape to enhance the views. It was after 4p by the time I returned to the wash at the base of the mountain. This last hike across the flat desert was the nicest of the afternoon, temperatures finally dropping to the low 60s and the sun coloring the Ord Mountains to the east in deepening shades of orange. I was back before 5p, not long after the sun had set, making for an outing of just under 3hrs. It was a fine break after the first six hours of driving and I was getting myself firmly into a fine desert mood.